I try to evaluate DB aduit 4 The product and I got a error message, someone please help. I install the audit expert on my local PC and using ODBC to connect Mysql 5.5 Linux server. So I right click on mysql server and select connect which without any problems. The problem is when I select "setup auditing of database access and user act ivies" , at panel "operations" , I select like login (fail) from operations listbox and then I click on enable system audit, a error dialog show as " database error occurred while your request was being processed, here are the details: SQLSLATE =S37000 [Mysql]ODBC 5.1 driver][mysqld-5.5.15-log] you have an error in your SQL syntax;check the manual that corresponds to your mysql server version for the right syntax to use near type=myisam' at line 13' . Only thing so far I did is connect to my database, Did I missing a step or something? Please install MySQL ODBC driver 3.5. The driver you are using now ODBC 5.1 is having compatibility issues with your version of MySQL server, it is generating some invalid SQL commands. Once you have the older driver installed, configure new ODBC connection and point DB Audit console to that new connection. Thank for your reply, I download the old 3.51 ODBC driver and install it ,then I uninstall the new odbc driver from my PC, but the same error dialog show up "... SQLSTATE=37000 ...[mysql][ODBC 3.51 Driver][.....". Please enable the tracing feature in the ODBC Administrator utility, reproduce the issue, and attach relevant fragment of your ODBC trace file with the commands leading to the syntax error. 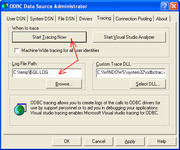 Please see http://support.microsoft.com/kb/274551 if you need instructions for how to generate an ODBC trace. I did the ODBC tracing , but there are no output in the log. I did as before that first I turn on the tracing , then I connect to MySQL database with odbc, then I select system audit, pick log in (fail) from list box. then click on "enable system audit" ,until the error show up. finally, I stop the tracing. After checking the log. There are nothing in the ODBC tracing log. Please pick a log file in some common directory like c:\temp not a user specific directory Windows is suggesting by default. I did click on the start trace button, then apply the change, After that, I start DB audit and did as I did before to got a error message , the I stop the trace. I check the log file which I setup up at c:\ which named "sql.log" , but nothing in the log. That is very strange. Which directory you selected for the trace file? The log path is "C:\SQL.LOG"
I try to trace the ODBC connect again, this time I got some data in the log. I will paste it below. WCHAR * 0x73549110 [ -3] "******\ 0"
PTR 0x00AB2CC8 [ 22] "myodbc3.dll"
PTR 0x00AB2CC8 [ 20] "03.52.0000"
PTR 0x00AB2150 [ 42] "www.dev.vlt.astro.com"
PTR 0x00AB1938 [ 6] "vms"
PTR 0x00AB2150 [ 2] "N"
PTR 0x00AB1938 [ 64] "www.dev.vlt.astro.com via TCP/IP"
PTR 0x00AB2150 [ 10] "MySQL"
PTR 0x00AB2150 [ 22] "myodbc3.dll"
PTR 0x00AB1DB0 [ 2] "`"
PTR 0x00AB2CC8 [ 10] "03.51"
PTR 0x00AB2DE0 [ 20] "remoteroot"
UCHAR * 0x01B86E14 [ -3] "set rowcount 0\ 0"
WCHAR * 0x0012E340 [ 78] "[MySQL][ODBC 3.51 Driver][mysqld-5.5.15-log]Unknown system variable 'rowcount'"
UCHAR * 0x01B86205 [ -3] "select decode ( 'ORACLE' , 'ORACLE' , 'OTHER' ) from dual \ 0"
WCHAR * 0x0012E2E8 [ 109] "[MySQL][ODBC 3.51 Driver][mysqld-5.5.15-log]Incorrect parameter count in the call to native function 'decode'"
UCHAR * 0x01B86EDC [ -3] "USE mysql\ 0"
PTR 0x00AB1938 [ 2] "Y"
UCHAR * 0x01B879C4 [ -3] "select version()\ 0"
WCHAR * 0x00AB1FD0 [ 8] "SQL_"
UCHAR * 0x0012E670 [ 9] "version()"
UCHAR * 0x01B87C0C [ -3] "select version(), @@version_compile_os\ 0"
WCHAR * 0x00AB2DD0 [ 8] "SQL_"
UCHAR * 0x0012E3F8 [ 9] "version()"
UCHAR * 0x0012E3F8 [ 20] "@@version_compile_os"
PTR 0x00AB2420 [ 22] "myodbc3.dll"
PTR 0x00AB1788 [ 20] "03.52.0000"
PTR 0x00AB1DB0 [ 42] "www.dev.vlt.astro.com"
PTR 0x00AB2FE8 [ 6] "vms"
PTR 0x00AB1DB0 [ 2] "N"
PTR 0x00AB2FE8 [ 64] "www.dev.vlt.astro.com via TCP/IP"
PTR 0x00AB1DB0 [ 10] "MySQL"
PTR 0x00AB1B50 [ 22] "myodbc3.dll"
PTR 0x00AB2150 [ 2] "`"
PTR 0x00AB1788 [ 10] "03.51"
PTR 0x00AB1938 [ 20] "remoteroot"
UCHAR * 0x02AC0D18 [ -3] "SELECT distinct source_db, source_owner, source_table, audit_table, audit_inserts, audit_deletes, audit_updates FROM db_audit.data_audit_trail ORDER BY 1, 2, 3 \ 0"
This is helpful. Could you please post the remaining part of the trace that got truncated in the post above? I will paste the rest of log below and it may use 2-3 posts for all of log. UCHAR * 0x02AC1008 [ -3] "DROP TABLE db_audit.data_audit_trail\ 0"
UCHAR * 0x02AB8A28 [ -3] "DROP TABLE db_audit.data_audit_columns\ 0"
PTR 0x00AB2FE8 [ 2] "Y"
UCHAR * 0x01B8C668 [ -3] "SELECT count(1) FROM information_schema.tables WHERE table_schema = 'DB_AUDIT' AND table_name = 'DATA_AUDIT_USERS'\ 0"
UCHAR * 0x0012F304 [ 8] "count(1)"
UCHAR * 0x01B8CA24 [ -3] "SELECT count(1) FROM information_schema.tables WHERE table_schema = 'DB_AUDIT' AND table_name = 'DATA_AUDIT_APPS'\ 0"
WCHAR * 0x00AB2008 [ 8] "SQL_"
UCHAR * 0x01B8C668 [ -3] "SELECT count(1) FROM information_schema.routines WHERE routine_schema = 'DB_AUDIT' AND routine_name = 'SP_AUDIT_SENDMAIL'\ 0"
WCHAR * 0x00AB2040 [ 8] "SQL_"
UCHAR * 0x01B8CA24 [ -3] "SELECT count(1) FROM information_schema.routines WHERE routine_schema = 'DB_AUDIT' AND routine_name = 'SP_PURGE_HISTORY'\ 0"
WCHAR * 0x00AB1938 [ 8] "SQL_"
UCHAR * 0x01B8C668 [ -3] "SELECT count(1) FROM information_schema.routines WHERE routine_schema = 'DB_AUDIT' AND routine_name = 'SP_DUMP_TO_LOG'\ 0"
WCHAR * 0x00AB1970 [ 8] "SQL_"
UCHAR * 0x01B8CA24 [ -3] "SELECT count(1) FROM information_schema.routines WHERE routine_schema = 'DB_AUDIT' AND routine_name = 'SP_LOG_MESSAGE'\ 0"
UCHAR * 0x01B8C668 [ -3] "SELECT count(1) FROM information_schema.routines WHERE routine_schema = 'DB_AUDIT' AND routine_name = 'SP_AUDIT_ARCHIVING'\ 0"
UCHAR * 0x01B8CA24 [ -3] "SELECT count(1) FROM information_schema.routines WHERE routine_schema = 'DB_AUDIT' AND routine_name = 'SP_AUDIT_ARCHIVE'\ 0"
UCHAR * 0x01B8C668 [ -3] "SELECT count(1) FROM information_schema.routines WHERE routine_schema = 'DB_AUDIT' AND routine_name = 'SP_AUDIT_PURGE'\ 0"
UCHAR * 0x01B8CA24 [ -3] "SELECT count(1) FROM information_schema.routines WHERE routine_schema = 'DB_AUDIT' AND routine_name = 'SP_AUDIT_SYSPURGE'\ 0"
UCHAR * 0x01B8C668 [ -3] "SELECT count(1) FROM information_schema.routines WHERE routine_schema = 'DB_AUDIT' AND routine_name = 'SP_EXECUTE'\ 0"
WCHAR * 0x00AB1970 [ 9] "SQL_"
UCHAR * 0x02AC45B0 [ -3] "SELECT count(1) FROM INFORMATION_SCHEMA.TABLES T WHERE T.TABLE_SCHEMA = 'db_audit' AND T.TABLE_TYPE = 'BASE TABLE' AND T.TABLE_NAME IN ('sys_audit_trail', 'sys_audit_options')\ 0"
WCHAR * 0x00AB1938 [ 9] "SQL_"
UCHAR * 0x0012F298 [ 8] "count(1)"
UCHAR * 0x02AC4680 [ -3] "SELECT count(1) FROM mysql.func WHERE name in ('db_audit_status', 'db_audit_reset')\ 0"
UCHAR * 0x01B8BEEC [ -3] "SELECT count(1) FROM information_schema.tables WHERE table_schema = 'DB_AUDIT' AND table_name = 'SYS_AUDIT_TRAIL'\ 0"
UCHAR * 0x01B8CA24 [ -3] "SELECT count(1) FROM information_schema.tables WHERE table_schema = 'DB_AUDIT' AND table_name = 'SYS_AUDIT_OPTIONS'\ 0"
UCHAR * 0x02AC3088 [ -3] "DROP EVENT IF EXISTS db_audit.e_audit_archiving\ 0"
UCHAR * 0x02AB8A28 [ -3] "DROP EVENT IF EXISTS db_audit.e_audit_purging\ 0"
UCHAR * 0x02AC59DC [ -3] "select 0 ordr, 'TRIGGER' type, trigger_name name from information_schema.triggers where trigger_name like 'AUDIT_TR_%' union all select 1 ordr, 'PROCEDURE' type, routine_name name from information_schema.routines where routine_schema = 'DB_AUDIT' union all select 3 ordr, replace(table_type, 'BASE ', '') type, table_name name from information_schema.tables where table_schema = 'DB_AUDIT' order by 1, 3\ 0"
UCHAR * 0x02AC598C [ -3] "DROP TRIGGER DB_AUDIT.audit_tr_d_201111151016224060\ 0"
WCHAR * 0x0012F3EC [ 66] "[MySQL][ODBC 3.51 Driver][mysqld-5.5.15-log]Trigger does not exist"
UCHAR * 0x02AC6420 [ -3] "DROP TRIGGER DB_AUDIT.audit_tr_i_201111151016224060\ 0"
UCHAR * 0x02AC598C [ -3] "DROP TRIGGER DB_AUDIT.audit_tr_u_201111151016224060\ 0"
UCHAR * 0x02ABECD4 [ -3] "DROP SCHEMA IF EXISTS db_audit\ 0"
UCHAR * 0x01B910F4 [ -3] "DROP USER db_audit@localhost\ 0"
UCHAR * 0x01B91111 [ -3] "DROP USER db_audit@127.0.0.1\ 0"
WCHAR * 0x0012F3EC [ 97] "[MySQL][ODBC 3.51 Driver][mysqld-5.5.15-log]Operation DROP USER failed for 'db_audit'@'127.0.0.1'"
UCHAR * 0x01B9112E [ -3] "FLUSH PRIVILEGES\ 0"
UCHAR * 0x01B9113F [ -3] "FLUSH TABLES\ 0"
UCHAR * 0x02B71328 [ -3] "SELECT count(1) FROM INFORMATION_SCHEMA.TABLES T WHERE T.TABLE_SCHEMA = 'db_audit' AND T.TABLE_TYPE = 'BASE TABLE' AND T.TABLE_NAME IN ('sys_audit_trail', 'sys_audit_options')\ 0"
UCHAR * 0x02B713F8 [ -3] "SELECT count(1) FROM mysql.func WHERE name in ('db_audit_status', 'db_audit_reset')\ 0"
UCHAR * 0x02B71468 [ -3] "SELECT db_audit_status()\ 0"
UCHAR * 0x02B71198 [ -3] "SELECT count(1) FROM information_schema.tables WHERE table_schema = 'DB_AUDIT' AND table_name = 'SYS_AUDIT_OPTIONS'\ 0"
UCHAR * 0x02B7AFA8 [ -3] "SELECT count(1) FROM INFORMATION_SCHEMA.TABLES T WHERE T.TABLE_SCHEMA = 'db_audit' AND T.TABLE_TYPE = 'BASE TABLE' AND T.TABLE_NAME IN ('sys_audit_trail', 'sys_audit_options')\ 0"
UCHAR * 0x02B7A598 [ -3] "SELECT count(1) FROM mysql.func WHERE name in ('db_audit_status', 'db_audit_reset')\ 0"
UCHAR * 0x02B78710 [ -3] "SELECT db_audit_status()\ 0"
UCHAR * 0x02B7CC28 [ -3] "SELECT count(1) FROM mysql.user WHERE user = 'db_audit'\ 0"
UCHAR * 0x02B87E24 [ -3] "CREATE DATABASE IF NOT EXISTS db_audit\ 0"
UCHAR * 0x02B78710 [ -3] "CREATE USER db_audit@localhost\ 0"
UCHAR * 0x02B7B904 [ -3] "SET PASSWORD FOR db_audit@localhost = PASSWORD('iaudit')\ 0"
UCHAR * 0x02B87E64 [ -3] "GRANT SELECT ON *. * to db_audit@localhost\ 0"
UCHAR * 0x02B88034 [ -3] "GRANT ALL ON db_audit. * to db_audit@localhost\ 0"
UCHAR * 0x02B87E24 [ -3] "GRANT ALL ON mysql. * to db_audit@localhost\ 0"
UCHAR * 0x02B837F2 [ -3] "INSERT INTO mysql.db ( Host , Db , User , Select_priv , Insert_priv , Update_priv , Delete_priv , Create_priv , Drop_priv , Grant_priv , References_priv , Index_priv , Alter_priv , Create_tmp_table_priv , Lock_tables_priv , Create_view_priv , Show_view_priv , Create_routine_priv , Alter_routine_priv , Execute_priv ) VALUES ( 'localhost' , 'db\_audit' , 'db\_audit' , 'Y' , 'Y' , 'Y' , 'Y' , 'Y' , 'Y' , 'Y' , 'Y' , 'Y' , 'Y' , 'Y' , 'Y' , 'Y' , 'Y' , 'Y' , 'Y' , 'Y' ) \ 0"
WCHAR * 0x0012E26C [ 109] "[MySQL][ODBC 3.51 Driver][mysqld-5.5.15-log]Duplicate entry 'localhost-db\_audit-db\_audit' for key 'PRIMARY'"
UCHAR * 0x02B83B10 [ -3] "INSERT INTO mysql.db ( Host , Db , User , Select_priv , Execute_priv ) VALUES ( 'localhost' , 'mysql' , 'db_audit' , 'Y' , 'Y' ) \ 0"
WCHAR * 0x0012E26C [ 104] "[MySQL][ODBC 3.51 Driver][mysqld-5.5.15-log]Duplicate entry 'localhost-mysql-db_audit' for key 'PRIMARY'"
UCHAR * 0x02B83BCC [ -3] "update mysql.db SET Select_priv ='Y' WHERE Host ='localhost' and User ='db_audit' \ 0"
UCHAR * 0x02B79726 [ -3] "FLUSH PRIVILEGES\ 0"
UCHAR * 0x02B78C1C [ -3] "SELECT count(1) FROM information_schema.tables WHERE table_schema = 'DB_AUDIT' AND table_name = 'DATA_AUDIT_TRAIL'\ 0"
Last post seems been cut off, so I will post line 6001-6956 again. UCHAR * 0x02B78AC0 [ -3] "SELECT count(1) FROM information_schema.tables WHERE table_schema = 'DB_AUDIT' AND table_name = 'DATA_AUDIT_COLUMNS'\ 0"
UCHAR * 0x02B7BD2C [ -3] "SELECT count(1) FROM information_schema.SCHEMATA WHERE schema_name = 'db_audit'\ 0"
UCHAR * 0x02B8852C [ -3] "CREATE TABLE db_audit.data_audit_trail (\ d\ a source_db VARCHAR(30) DEFAULT 'N/A' NOT NULL,\ d\ a	source_owner VARCHAR(128) NOT NULL,\ d\ a	source_table VARCHAR(128) NOT NULL,\ d\ a	source_table_alias VARCHAR(128) ,\ d\ a	audit_table VARCHAR(30) NOT NULL,\ d\ a	audit_trigger VARCHAR(30) NOT NULL,\ d\ a	audit_inserts INTEGER DEFAULT 1 NOT NULL,\ d\ a	audit_deletes INTEGER DEFAULT 1 NOT NULL,\ d\ a	audit_updates INTEGER DEFAULT 1 NOT NULL,\ d\ a	audit_notify INTEGER DEFAULT 0 NOT NULL,\ d\ a	mail_recipient VARCHAR(255) ,\ d\ a	mail_cc VARCHAR(255) ,\ d\ a	key_columns VARCHAR(255) ,\ d\ a all_columns INTEGER DEFAULT 1 NOT NULL,\ d\ aPRIMARY KEY (source_db, source_owner, source_table, audit_trigger))\ 0"
UCHAR * 0x02B8839C [ -3] "CREATE TABLE db_audit.data_audit_columns (\ d\ a source_db VARCHAR(30) NOT NULL,\ d\ a	source_owner VARCHAR(128) NOT NULL,\ d\ a	source_table VARCHAR(128) NOT NULL,\ d\ a	column_name VARCHAR(128) NOT NULL,\ d\ a	column_name_alias VARCHAR(128) ,\ d\ a update_filter INTEGER DEFAULT 0 NOT NULL,\ d\ aPRIMARY KEY (source_db, source_owner, source_table, column_name))\ 0"
UCHAR * 0x02B78AC0 [ -3] "SELECT count(1) FROM information_schema.tables WHERE table_schema = 'DB_AUDIT' AND table_name = 'SYS_AUDIT_TRAIL'\ 0"
UCHAR * 0x02B82CE8 [ -3] "CREATE TABLE db_audit.sys_audit_trail (\ aevent_time	datetime not null,\ auser	varchar(255),\ ahost_name	varchar(255),\ aschema_name	varchar(255),\ athread_id	int,\ alog	char(1),\ alog_event	char(7),\ aevent_class	varchar(20),\ atext_data	varchar(20000),\ aobj_type	varchar(255),\ aobj_name	varchar(255),\ aerror_code	int) TYPE=MyISAM\ 0"
WCHAR * 0x0012E4A4 [ 202] "[MySQL][ODBC 3.51 Driver][mysqld-5.5.15-log]You have an error in your SQL syntax; check the manual that corresponds to your MySQL server version for the right syntax to use near 'TYPE=MyISAM' at line 13"